The new Morclean Industrial Bus wash System has been developed for customers who need to clean a large amount of vehicles quickly and efficiently. It can be manufactured and installed in various sizes and wash combinations to suit all types of vehicle and fleet size. Whether you have a fleet of single decker, double decker, luxury coaches or mini-buses , your needs can be accommodated. 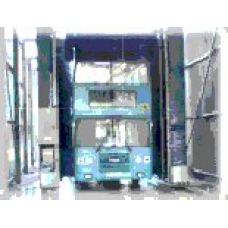 Built from rigid galvanised frames, the bus wash is a fixed vehicle wash with four vertical brushes and one horizontal brush, and it comes with total side closing. It has the capacity to wash up to 30 vehicles per hour. Automatic cycles are programmed to suit the demands of the operator and size of the fleet. Optional features include automatic frost protection, guide rails or under chassis washing. All Morclean Drive Through Vehicle wash Systems can be used in conjunction with a Morclean Water Reclaim System. These cost effective systems collect waste water in an Interceptor and then recycle it for later use. Morclean also design and specify all civil works, interceptors, water reclaim and discharge, and drainage. Our team of technicians will be pleased to offer all the necessary advice.